Philip Blumel: They don’t call it the Term Limits Day for nothing. Hi, I’m Philip Blumel. 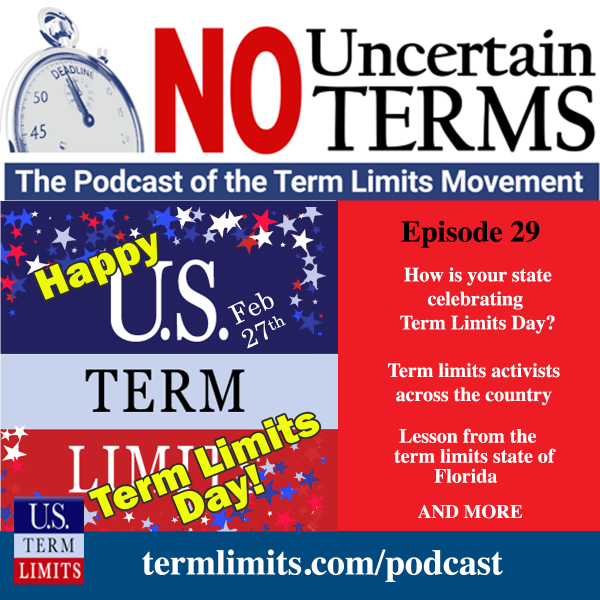 Welcome to the No Uncertain Terms podcast for the week of February 27th, Term Limits Day. Deep down in Florida, there was another step forward on the path to imposing eight-year term limits on all school board members in the state, plus Florida voters were asked what they think of these proposals and their competitors. Throughout this podcast, we’ll be hearing citizen testimony before legislative hearings in Tallahassee, Florida. US Term Limits National Director Nick Tomboulides was on the scene in Tallahassee this week. Hey, Nick. Nick Tomboulides: Phil, Happy Term Limits Day. Philip Blumel: And to you too. Well, Florida’s at the forefront of term limits activism once again. There’s more progress being made regarding term limits on school boards, and you were in Tallahassee this week. What happened? Nick Tomboulides: That’s right. Florida has more term limits than any other state, but one notable exception to this term limits culture is the school boards. School boards in Florida in all 67 counties are for whatever reason allowed to serve for life, and we want to change that. Here we believe in term limits for every office from congressmen down to dogcatcher, and smack dab in that sweet spot is school boards where members can often stick around for 20, 30, sometimes even 40 years. In Florida, school board members are paid, unlike most other school boards in the country where it is more of a public service volunteer position. Nick Tomboulides: … by a vote of 11 to four. Now the amendment has just one more stop before it gets to the floor of the state House. Of course, it also has to get through the state Senate, but this is a great early, encouraging sign of progress. Philip Blumel: It sure is. Both of these votes were lopsided. One of them was unanimous, in favor, and the other was 11 to four, and they’re both bipartisan, and what’s the next stop? Do we know yet? Nick Tomboulides: … in the state House, the full Education Committee and then it will go to the floor. Alex Snitker: My name is Alex Snitker with the Liberty First Network. I wanted to speak in support of this bill. Some of the things that were said earlier about we already have term limits, they’re called elections. In the 2018 election cycle, 90% of the incumbents running in school board races won, and many of them were unopposed. One of the things you’re not going to get is competition, and the reason is is because if a person is looking at a race reasonably and saying, “Well, 90% of the time the incumbent already wins,” then you’re not going to get as much competition in those races, but every time if somebody has an eight-year term limit, and that seat goes up, then there’s a whole bunch of competition that comes in to replace those, and all the other seats that we have eight-year term limits for. I can’t imagine it would be any different for the school board. I think that you would have a lot of competition within there. Alex Snitker: There is an incumbency advantage when it comes to fundraising. It’s just is what it is, which is sometimes so great that the incumbent faces no serious opposition at all, and at the end of the day, and I know that the representative said it already, this is not whether you support term limits or don’t support term limits. It’s whether you think that the public should be able to vote on term limits. That is really the most important question that we have here today. Scott Tillman: Hello. This is Scott Tillman, the National Field Director with US Term Limits. I wanted to give you an update on the status of our legislation in congress. Legislation has been introduced in both the House and the Senate. In the Senate, it is SJR 1, and that was introduced by Ted Cruz from Texas. That currently has 10 sponsors total including Ted Cruz. In the House, it’s HJR 20, and that was introduced by Francis Rooney from Florida, and we currently have 35 total sponsors and co-sponsors in the House of Representatives. The most recent two came on just this week in the House of Representatives, and that was Mark Green from Tennessee’s 7th district, and Chip Roy from Texas’s 21st district. Philip Blumel: Where I live in Palm Beach county, our budget each year on our school board is $2.9 billion, and naturally that means there’s special interests that have their eye on that, and they want a piece of that pie, and we have school board members that make these decisions with these large amounts of money, and yet, like elections at other levels of government, we don’t see competitive elections and rotation in office, and these relationships get established, and they become permanent, and these special interests are funneling money out of our system at the expense of our kids and our parents. Nick Tomboulides: … for campaign spending, which really creates this huge barrier to entry for any ordinary, goal-oriented person who would like to serve. In other parts of the country, it’s even worse. You have million dollar school board races. We need to cut that off at the pass, and remind ourselves that this is citizen public service. The best way to do that is obviously an eight-year term limit. Speaker 7: Bob White of Melbourne, Chairman of the Republican Liberty Caucus of Florida. Bob White: The founders have this idea that citizen would come forward, be they farmers, be they attorneys, be they merchants, and they would spend a few years discussing the issues of the time and the day and legislating, and then they would go home and allow someone else to have the opportunity to come in and fill that same role, and I think that it’s especially … at the school board level, at that local level, school board, county commission levels, we’re talking about people making 40, 50, $60,000 and up in many, many cases, and I think the potential for abuse really exists at that level, certainly much more so at this level. Bob White: No one would ever accuse any of you at this table for being in it for the money. The sacrifices that you make, leaving your family, leaving your homes and coming up here and doing the work of the people on behalf of the people, no one would ever accuse you of that, but I think the potential really does exist for that at a county commission level or at a school board level where those kind of salaries are being paid. Obviously, the only way to address that is with term limits, so we’re very pleased to be here today to be able to speak on behalf of the bill and would encourage you to pass it. Nick Tomboulides: First of all, they said, “I don’t think the people of Florida are for this.” Well, we’ve just disproved that because we commissioned a poll last week by Pulse Opinion Research. It’s one of the most respected polling firms in the country. It was all about school board term limits in Florida, and this poll found that 77% of Florida voters want an amendment to the state Constitution that will term limit all the school board members. I don’t even think Florida’s beaches have an approval rating that high. Stacey Selleck: Hey, everyone. Term Limits Day is right around the corner, this Wednesday, February 27th. I hope you’ve made your Happy Term Limits sign or purchased your term limit congress t-shirt or baseball cap from our online store at termlimits.com/shop. Our Term Limits Day festivities have filled up our calendar. You can find it on our website at termlimits.com/events, or if you’re on Facebook, go to Facebook.com/ustermlimits/events. Stacey Selleck: We have activities going on in Florida and Maine, New Hampshire, Maryland, Michigan, Georgia, South Carolina, a bunch in Kentucky, Alabama, West Virginia, and Arizona. If you’re an early riser, and you live in Grand Rapids, Michigan, there’s a 7:30 a.m. sign wave at the Big Boy restaurant. In Concord, New Hampshire, at 8:00 a.m., there’s a breakfast meeting at Tandy’s Pub and Grille. In Center Conway, New Hampshire, at 5:00 p.m., there’s also an event at the Center Conway Baptist Church. In Harrison, Maine, there’s an event at 6:00 p.m. at 42 Main Street. At the State House in Maryland in Annapolis, there’s a 9:00 a.m. event. In Summerville, South Carolina, there’s a 12:00 p.m. Wescott Golf Club luncheon. And, at 11:00 a.m. in Atlanta, Georgia, at the Coverdell Legislative Office Building at the Georgia Capitol, there’s also a Term Limits Day event. Stacey Selleck: Moving down to Florida, in New Port Richey at noon, there’s a luncheon at Johnny Grits. And in Palm Beach, there’s a sign wave at 11:00 a.m. In Phoenix, Arizona, there’s a luncheon, meeting and sign wave at Mission Possible Café. And at Sweet Creek Farm Market in Pike Road in Alabama, there’s also a Term Limits Day celebration. In West Virginia, if you live in Martinsburg, at 10:00 a.m. there’s a breakfast and a sign wave at the Cracker Barrel in Martinsburg, West Virginia. And, in Kentucky, there are four events. At 5:00 p.m. in Lexington, 5:00 p.m. in Florence, 5:00 p.m. in Louisville, and 6:30 p.m. in Owensboro. Why don’t you check out these events on Facebook, RSVP, and join us to celebrate the first time ever National Term Limits Day on February 27th. We look forward to celebrating with you. Speaker 7: Shawn Frost of Sebastian, activist, campaign strategy consultant, and former school board Member. Shawn Frost: Why we need term limits. George Stigler who’s a Nobel Prize winning economist, first came up with the concept of regulatory capture, and that’s where the governing body that is meant to regulate an industry becomes captured by that industry and serves an entrenched special interest of that industry, and therefore becomes captured and cannot make independent decisions. We all know this as elected to the power of incumbency. For that reason, what we need is, it’s not 12 years, it’s eight years. When it comes to ending regulatory capture, eight is not only enough, eight is great. Nick Tomboulides: There was a question among some of the committee members about whether the term limit for school boards should be eight years or 12 years. Philip Blumel: Right. That keeps coming up. Basically, the opposition to term limits who feel like they can’t beat it completely, they want to be able to claim they support term limits too. They’ll support it, but they think the proper number is 12, and it’s because they can’t get no term limit that they would even support 12, but the people aren’t fooled by this. Nick Tomboulides: Eighty-four percent of Florida voters who want this amendment said they prefer an eight-year amendment versus just 10% who prefer 12 years. Philip Blumel: Surprise, surprise. Well, great. You presented this directly to the legislators themselves at this committee hearing, and what was their reaction? Nick Tomboulides: I’ve previously come to this platform to make the case for term limits, how it’s a check on incumbency, creates more competitive elections, makes government more diverse, and gets people to do what’s right instead of what’s right for themselves. But today, I’m going to be taking a different approach. Instead of talking about term limits, I want to show you a new poll so you can see how the people of Florida, your constituents, feel about the issue. This is from Pulse Research, which does all the field work for Rasmussen. It was just finished, and we’re making it public today for the first time. Nick Tomboulides: What did the poll find? That 77% of Florida voters statewide want a Constitutional amendment term limiting all school board members, and it’s a very bipartisan issue. It’s got 85% support with republicans, 67% were democrats, 76% with Independents. We also wanted to measure support for the two most common proposals out there eight versus 12. Eighty-four percent of voters prefer an eight-year term limit for school boards, as opposed to a 12-year term limit. Nick Tomboulides: And since this debate started, one of the major objections has been what about rural counties? We’re told that they don’t like term limits. You know who disagrees with that? The people who live in rural counties because we did another survey, and we found that school board term limits are more popular in rural counties than they are statewide, so that argument is a non-starter. Thank you for your time. Philip Blumel: Did anyone try to combat that datum? Nick Tomboulides: But, the data is just overwhelming, and you look at what term limits have done when they’ve been on the ballot at any time in the last 20 years. They always pass with between 70% and 90% support when the question is phrased honestly to the voters. Philip Blumel: Right. If there’s a legislator that is blinkered enough to really believe that the public isn’t for term limits, it’s probably because they’re spending too much time in Tallahassee and have been there too long because there are certainly a lot of people in Tallahassee that oppose term limits. First of all, the lobbyists and special interests, the staffers, many of the members themselves. There’s a culture of anti-term limits in the capitol, but it doesn’t exist anywhere else, although there’s pockets in the capitol that support it like you mentioned. This is a term limit legislature itself, but also we have a new governor, and this new governor, Ron DeSantis, is one of the foremost term limits advocates at any level of government in the country. And now, he has the top job in the term limits state. Nick Tomboulides: That’s right, and he has endorsed this proposal. He has written essentially that school boards are plagued by the same unbreakable incumbency that you see in congress, and that has to be addressed. He said that term limits would infuse school boards with more of a reformer spirit and attitude that you don’t see right now. Speaker 7: Shayna Lopez Rivas of Tallahassee, a citizen activist. Shayna Rivas: Term limits are not a new concept in Florida. The governor’s office has a term limit. The office you all currently hold has a term limit. In fact, most elected positions for the state and many elected positions on local levels have term limits. It almost comes as a surprise that school boards have been allowed to go so long without them. Term limits are necessary because they protect the sanctity of that which we hold so dear in America, democracy. In fact, term limits are the lifeblood of democracy. Shayna Rivas: Term limits provide opportunities for citizens to win public office by requiring turnover of otherwise politically connected and entrenched school board officials. Term limits open up access to underrepresented segments of our community, and allow new board members to bring fresh perspectives and fuel new ideas for local education. Term limits also encourage school board members to make the most of their time in office and enact positive changes to the education system in their local communities. When you know you only have eight potential years, you want to make sure those years are spent maximizing and creating positive change. Shayna Rivas: There is no elected office in America that is better off with a career politician, not one. If two terms is good enough for so many other elected positions in Florida, then a two-term eight-year limit is good enough for our local school boards. If you want to do what is right for our kids, for our future generation, you will vote to allow myself and millions of other Florida voters the ability to choose whether or not we want term limits on the school boards who handle their education. Thank you. Nick Tomboulides. : And some folks have said, “Well, why are you talking to politicians about passing term limits? Isn’t that kind of like putting the foxes in charge of henhouse policy?” Not really. This is a check and balance. The state legislature can provide oversight of school boards because school boards are established by the state Constitution, and when you really break it down, either a politician has to vote for term limits and side with the people, or he has to vote against them and side with his own self-interest. I’ve always thought that that is a false dichotomy because voting for term limits really is in every politician’s best interest because this issue is so popular. It’s so popular that if you run on term limits, you can get elected, you can get reelected, you can serve for a decent amount of time, and then come back to live as a citizen. Nick Tomboulides: We’ve actually had a question in the poll that bears this out. We asked, “Voters, are you more or less likely to support a candidate for the state legislature if you knew he or she helped pass term limits on school boards?” Sixty-seven percent of voters said they are more likely to support their state representative if he or she wants term limits. Nick Tomboulides: This is good for our country. This is good for the citizens. It’s good for building a government that’s more accountable, and last but not least, it is good for the politicians themselves. It’s not just politically popular, but I think when term limits take effect, it has a humbling effect on politicians too. Philip Blumel: Right. That works when the people are engaged and know, and that’s what we’re trying to do with US Term Limits. Philip Blumel: Thanks for joining us for the Term Limits Day edition of No Uncertain Terms. The mission today of course is to show some public support for term limits in any way you feel comfortable. Whatever you do, send us a photo at termlimitsday@termlimits.com. We’ll feature your handiwork online and in our promotional materials for next year’s Term Limits Day. And of course, please subscribe to this podcast. You can use the podcast app on your iPhone. You can use iTunes, Stitcher, Google Play, you name it. We’ll be back next week.